Yona Yacobowicz transforms her turbulent life into song. Yona Yacobowicz has experienced much hardship, yet her music is full of life and hope. Born to a religious family in Saratoga Springs, New York, a hotspot of culture and the arts (it's the summer home of the Philadelphia Orchestra, New York City Ballet and hosts major Jazz, Folk and Rock festivals), Yona was immersed in music from her early childhood, attending seminars lead by major performing artists. Music spoke to her soul, giving her a way to express her inner passion. As a child, she was already an accomplished percussionist and pianist, studying with such great jazz drummers as Max Roach, Elvin Jones and Mel Lewis. "I was raised with the attitude that the Torah is a beautiful lifestyle and that it's the source of truth, therefore everything is possible within it," Yona said. "If God places a gift inside you, you should develop it, appreciate it and use it to serve Him. There were no doors that were closed to us; we just did it within the framework of Torah." Yona decided to pursue degrees in early childhood education and music. She hoped to someday follow her older brother and eventually settle in the land of Israel. Then at the age of 19, she encountered her first major setback. Suddenly it became increasingly difficult for Yona to use her limbs and she was diagnosed with Rheumatoid Arthritis. She spent the entire year confined to a wheelchair and had to relearn to play drums and the piano. To this day she has to use special drum sticks equipped with gripping devices that enable her to hold them and she has walked with a cane ever since. "Like music, within a limited amount of notes there are an infinite amount of possibilities." While looking out at the world from the confines of her wheelchair, Yona focused on learning to see the best in any given situation, a skill that would aid her in the many struggles to come. Music became a way for her to find hope. "It's not that a door is closed," she said, "it's a matter of looking at what door the Almighty is opening. Limitations are actually a way to be freer. Instead of thinking what I can no longer do, I think what it is that I can do. I have new challenges, but am I a victim or am I in charge of creating something new? Like music, within a limited amount of notes there are an infinite amount of possibilities." 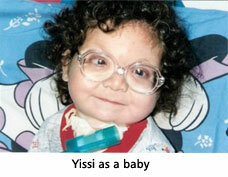 During this time, Yona contracted a rare blood disorder and became deathly ill without warning. In the emergency room she had a near-death experience, feeling herself leaving her body and pulled toward a powerful light. It felt more wonderful than anything she had ever experienced in this world. This experience has been an inspiration throughout her entire life and she has made it her mission to spread that light to the world. In 1981, as soon as she had recovered sufficiently enough to travel, Yona boarded a plane for Israel to fulfill her dream of studying in seminary. Learning Torah in the Holy Land was greater than she had ever imagined. She soon developed friendships with other young women musicians from various seminaries and they started to get together on a regular basis to jam. 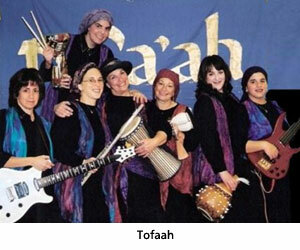 Yona became the leader of what was to become the first all women's orthodox Jazz Rock and Blues band, Tofa'ah, meaning a 'phenomenon' or 'happening' playing on the Hebrew word for drum, tof. "Everything in life is a phenomenal happening," Yona said. "Every breath we take is a miracle." Tofa'ah has been playing her compositions for over 25 years. The band has recorded nine albums to date. After so many years together, it is like a family. The women of Tofa'ah strive to foster unity, joy and inspiration through their dynamic music. In addition to the unique make up of the band, their audience is also special; in keeping with Jewish laws of modesty, Tofa'ah only performs in front of women. They have toured the U.S., play shows all over Israel ranging anywhere from women's prisons to the Chassidic court of the Belzer Rebbetzin, and have appeared numerous times on Israeli radio and television. Yona also co-founded a non-profit organization, Tof Miriam, the drum of Miriam, which supports women in the arts in Israel. Yona married at 27, after having dated for an extended period. They didn't have children for five difficult years. During this time they went to receive a blessing from their rabbi, Rabbi Chaim Pinchas Sheinberg. Rabbi Sheinberg told them to be very careful with the mitzvah of guarding their speech, and in the merit of scrupulously observing this mitzvah they would God willing come back with good news within a year. The Yacobowicz's spent the next year trying extra hard to avoid using forbidden speech, like hurting others or gossiping. Exactly one year later they found out that they were expecting. They were overjoyed. But the birth went nothing like planned. Their son was born with a long list of disorders and defects ranging from cleft palate, to club feet and holes in the heart and he was in critical condition. Instead of hearing the doctor say the traditional "Mazal tov, it's a boy!" he fired off a string of urgent commands to the nurses at hand ending with "Shomer et haloshon, watch his tongue!" Since the baby was also born with an unusually small airway, making it extremely hard for him to breath, his tongue posed a great risk to cutting off his oxygen supply. Despite the trauma of the situation, Yona took this as a sign that just as her son was conceived in the merit of "guarding their tongue," he would survive in that merit as well. But at that moment, the situation looked very grim and the doctors were skeptical that the baby would survive. "I didn't have the 'perfect' baby but I did have the perfect baby for me." "Every mother loves their child, no matter what the problems may be," she said. The question is whether they are willing to take the responsibility. Be who you're supposed to be. So too, if God gives you a crisis in life, you can choose to run away from it or you can choose to accept the responsibility. I didn't have the 'perfect' baby but I did have the perfect baby for me." Her son Yisrael Meyer is now 13 years old and his survival to this day has been nothing short of miraculous. 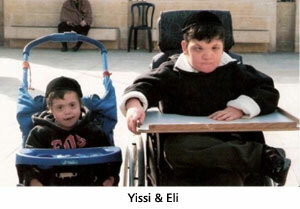 The Yacobowicz's spent most of the first four years of Yisrael Meyer's life living in one hospital ward or another. When his condition had at last stabilized sufficiently to be released, they had to convert their home into an intensive care unit complete with oxygen tanks, resuscitation machines, and IV's. Yona recounts that numerous times her son died in her arms and had to be resuscitated. "It's a life and death situation every time we feed him." When Yisrael Meyer was one year old, his parents were on their way to see a specialist, when he suddenly started to go into septic shock. "The doctors saved his life. If we had been going to see a dentist or an eye doctor they wouldn't have been able to help him." It just so happened that they were on their way to a pulmonologist. Yisrael Meyer's life was saved but there was permanent damage, affecting the left side of his brain and severely limiting his speech and movement. Today he is blind in one eye, and has undergone countless surgeries, including heart surgery and a tracheotomy. He communicates through the use of a picture board and despite the many challenges facing him during his young life, he has above average intelligence and shows incredible love of life and learning. Five years ago, Yona gave birth to a second son, Eliyahu, who was also born with many similar symptoms as Yisrael Meyer, in addition to having Downs syndrome. It was eventually discovered that Yona was the carrier of a genetic disease known as Stickler's syndrome which was responsible for her premature arthritis as well. On top of everything, the Yacobowicz's were divorced a few years ago. Although Yona is now raising two disabled children on her own, severely weakened by her own disability, she still continues to possess a positive attitude. Monthly medical expenses are exorbitant with nursing care, medications, therapy, doctors bills and equipment adding up to over $5000 every month, most of which is raised from charity. The entire community has rallied to her aid, providing financial, emotional, and physical support. They are joined by at least five volunteers daily. A professional nurse stays in the children's room every night in case oxygen is needed. Yona recounts that there are days when the medicine doesn't come in and money is needed to pay for upcoming operations and bills and there's no food in the fridge. Suddenly there is a knock on the door and someone comes in with the exact amount of money she needs along with a hot pot of soup, a listening ear and a hug. "Everyone needs to ask themselves 'why me,'" she said. "If you don't ask that question then you don't get to know yourself. Not 'why me' as a victim, but 'why me' as a survivor -- what can I learn from this, what is it here to teach me? Of course there are times when I feel I can't do it, and that's when I ask myself 'Why me?' and the Almighty says, 'Because you can do it,' and I find the strength to keep on going." "Not 'why me' as a victim, but 'why me' as a survivor -- what can I learn from this, what is it here to teach me?" Yona finds an endless wellspring of strength in her music and her faith. Her greatest pain is that she lacks the physical strength to hold her children in her arms. "That's when I cry. My little son comes up to me every day asking me to hold him. We have to find a way to hold each other." When she finally lets her heart win out over her brain and picks him up, she has to go to a chiropractor. "My friends think I'm crazy. No, my heart's not crazy. I have to weigh what kind of pain to feel, the physical or the emotional. I have to choose every day." One time the great violin virtuoso Itzhak Perlman broke a string during a performance and instead of switching instruments in the middle, he just kept on playing. "My soul says 'Play me.' I only have three strings now, I have to find another way to play that symphony." Yona Yacobowicz is an extraordinary woman who triumphed over a debilitating physical illness and founded Tofa'ah, the Jewish world's first women's band. Read her incredible story—and the inspiring medical odyssey that she took with her beloved son, Yisroel Meir—in The Miracle Next Door (Targum Press, 2004), written by Yona and her devoted neighbor Malka Adler, also author of A Second Helping of Sunshine, published by Targum Press. HOw is YOna doingt these days? Does she need assistance? May G-d bless this remarkable lady and her family with only good things (revealed good). What a gusty response to hardships. such a touching story. This young woman's strength is tremendous. Hashem has blessed her. Makes me feel awful, when I realize how small my own problems are. My mother and I read this article together and are amazed at your great strength and your love for Hashem, despite difficult times. May you be zocheh to receive all of Hashem's blessings this new year! There are so many people who have tremendous challenges in life and they continue with such grace and strength. We look at them in awe. Yona is an extraordinary woman with much courage and tenacity. She does what she does because she wants what every woman wants, children to love. May Hashem bless you and your children with good health. Hashem should bless you with continued strength, simcha, refuah, good times with your special sons, and may you inspire klal yisroel to care a lot about each other and help those in need. All the best. I feel so moved by this story.Yona you are complete inspirational and beautiful person.Please tell me how i can make a contribution to help Yona and her two angels. I am so moved by you Yona. You possess tremendous strength.I am in awe reading about your challenges and how you have overcome and risen above to see the hand of H-shem in your life with tremendous simchat hachayim. You exemplify what it means to be mekabel yisurim beahava (accepting adversity with love). What a tremendous lesson to be learned before Rosh hashanah and the Days of Awe. Thank you for the inspiration and may H-shem grant you health, refua shleima,strength and a parnassa tova for the upcoming year. May you continue to see much nachat from your beautiful children, pure souls in this world! You are truly amazing!!! Chativa Tova! PS- How can we contribute to Yona's cause? You are an amazing woman. I hope you see how blessed the world is with someone like you within it. Thank you HaShem for her strength. talk about surmounting life's challenges! Yona seems to have her portion of them and then some and yet she keeps on going! What an inspiration to anyone - no amtter what challenges the rest of us face, she has it and more - financial, physical, and familial. and yet she surmounts them with flying colors. INDEED I´VE READ SO MANY ARTICLES YET I NEVER HEARD SUCH A BEAUTIFUL STORY AS THIS YONA DEAR I MYSELF I´M NOT ENJOYING GOOD HEALTH.I´M TRYING TO CARRY IN ME GOD´S HOLY WILL AS U DO.YET I MUST BE SINCERE TO LET U KNOW THAT I DONT REACH TO YOUR FEET. MY PRAYERS & LOVE WILL ACOMPANY U EVER. Amy. Dear Yona, you are so good and loving mom. I'll pray for you and your children. Let God bless you! Thanks for sharing your life with us Yona. May you always have great health and nachas from your children. I'm a big fan of Yona's and I try never to miss a Tofa'ah concert if I can help it. The inspiration and the amazing achdus and joy that Yona and her band manage to generate from the stage, especially when you know a bit of her story, is unbelievable. You get the sense that everyone in the audience is flying higher and will leave a little kinder, a little more appreciative of each other and ready to spread more light in this dark world. I see other readers want to know where to get Tofaah CDs (I've got them all, so I know!) ... in Israel you can get them by sending a message to Tofaah through their MySpace page (where you can also listen to 4 songs for free). They also sell CDs through CDBaby.com. I also know the Jeursalem Municipality has scheduled(iyH) a huge Simchas Beis Hashoeva TOFAAH CONCERT at Matnas Romema in Jerusalem on Wednesday evening of Chol Hamoed Sukkos. I go every year - over a thousand women come to dance and rejoice in the holiday and it is an experience not to be missed! I read Yona's book and was amazingly moved. This article is a fitting P.S. to the book. I was wondering where Yona lives. My daughter is in Israel for the year and it would be a great privilege if they could meet. Thanks. I'd like your cd's too. Speaking as a musician, also with disablities, though not as great as yourself, I'm curious about your music. I too compose, but nobody has ever heard of me, devorahssong. Only some locals, that is all. I'm EXTREMELY low-income. During the year I'm a substitute teacher-with no gauranty of work. In fact, I've no work so far this year! One cannot evaluate what may have been for Yona all those years of challenge for herself and her children. But it is clear that she has a mission, a gift from God: She turns all suffering into ways to promote love, and love amidst suffering is what we are required to display. There are times when we can only count on God. And, suddenly, He sends someone to show us His face and His love for us, and care for our needs. God Bless Yona and her children with much love, strength and hope that God will provide all for them! Shalom! Reading this, I fully realize how the person who takes up 2 parking spaces, and the man who goes through the check- out slowly are really nothing. If large disabilities cannot stop us, neither should minor annoyances. I have been in such emotional pain but never show it. But here is a woman who can rise above such unbelievable challenges and love it. This is amazing. I've heard Tofaah, but I never noticed that Yona had any physical limitations. I'm sure I didn't notice because she has NO spiritual ones. Thanks for the chizuk. I have to admire Yona's indomitable spirit. I don't know how I would have dealt with these ongoing challenges and the heartbreak. We each deal with painful life decisions in our own way, and I think that if we make decisions knowing the angst of these decisions, both ways, that's the best we can do. I can only say, she lives her life in the light. There is so much pain and also triumph and example in this, her story. It's about love. I have to believe that for us all, somehow, it all resolves in love. Love is the answer. To know Yona is to be inspired. The author did a wonderful job of summarizing the amazing spirit of Yona. Since the first time I saw her play the drums with so much enthusiasm despite the pain it caused, I have been inspired to "play through the pains" in my own life.